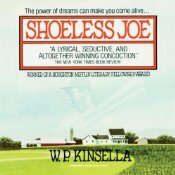 Shoeless Joe by W. P. Kinsella is a lovely book, better than the movie they made of it, Field of Dreams. Blackstone just re-released this on Audible. They also have my recordings of Kinsella's The Iowa Baseball Confederacy and Box Social on cassette--apparently they haven't been digitized yet. I hope they get around to that soon. I remember doing research for this by watching both Field of Dreams and John Sayle's excellent movie about the Chicago Black Sox, Eight Men Out. I was struck by the fact that several of the players' names were pronounced differently in the two movies. I called the Baseball Hall of Fame and found out that Field of Dreams had it wrong and Eight Men Out had it right. Eight Men Out is a far better movie about the Black Sox (and baseball in general). But Shoeless Joe is wonderful book about life. Recommended.